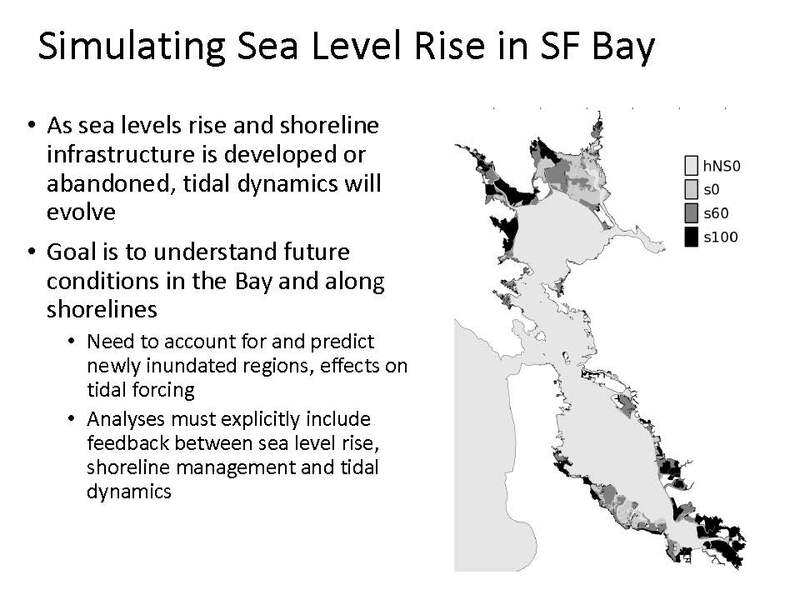 With sea level projected to rise at least one meter by 2100, possible even more, much needed attention is being paid on how to prepare the San Francisco Bay’s extensive shoreline to adapt to significant amounts of sea level rise. 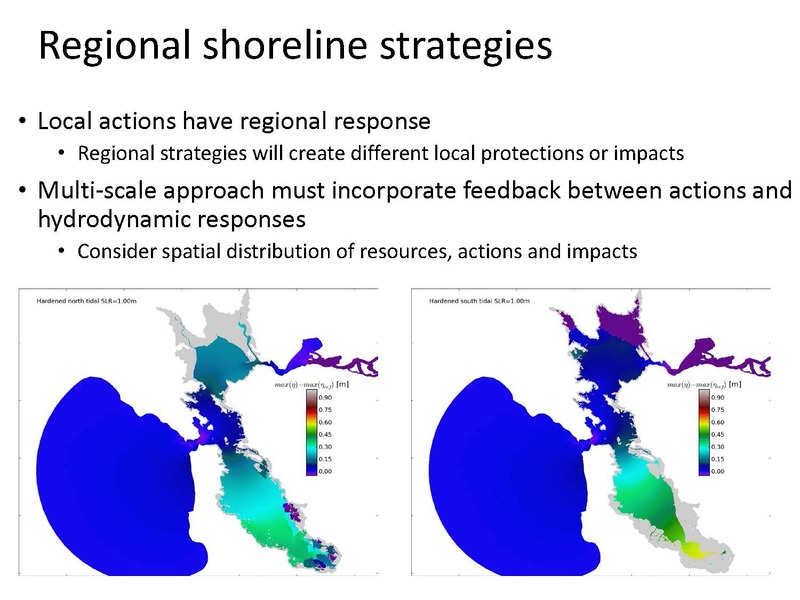 At the seminar, New Approaches for Responding to Climate Change in the San Francisco Bay-Delta presented by the UC Davis Center for Aquatic Biology and Aquaculture and the Delta Science Program, UC Berkeley’s Dr. Mark Stacey discussed the latest research on how sea level rise will impact the bay area. 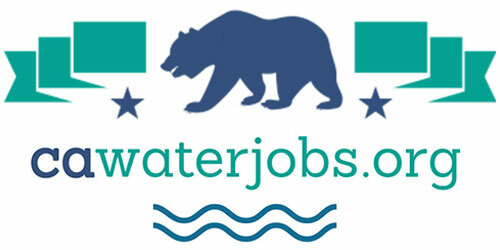 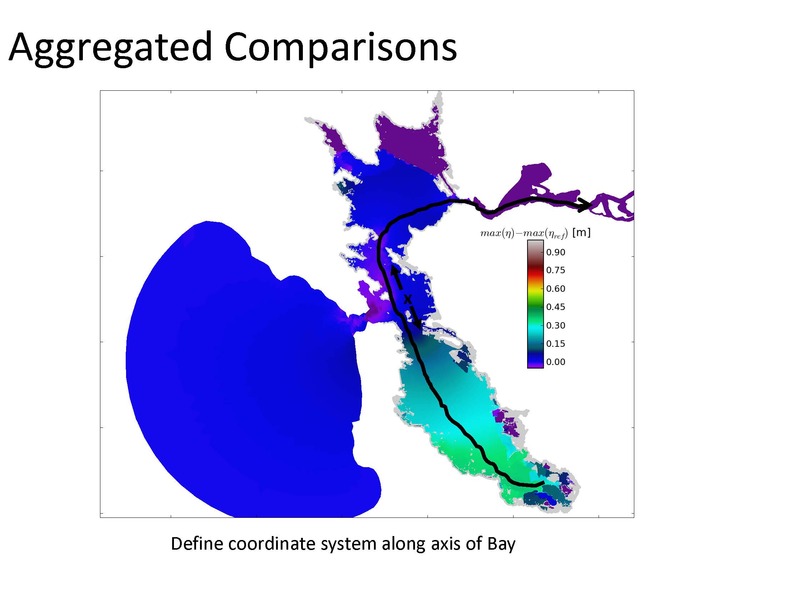 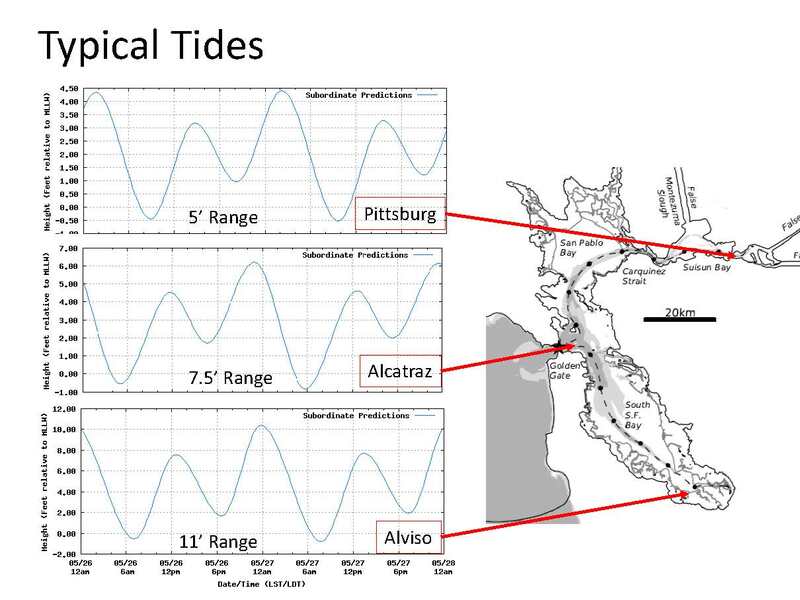 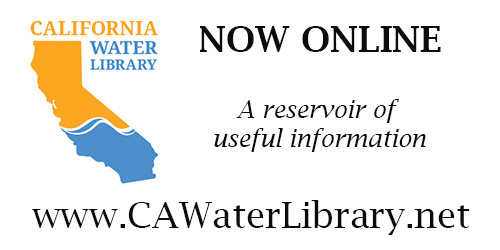 There are several factors that determine water levels within San Francisco Bay. 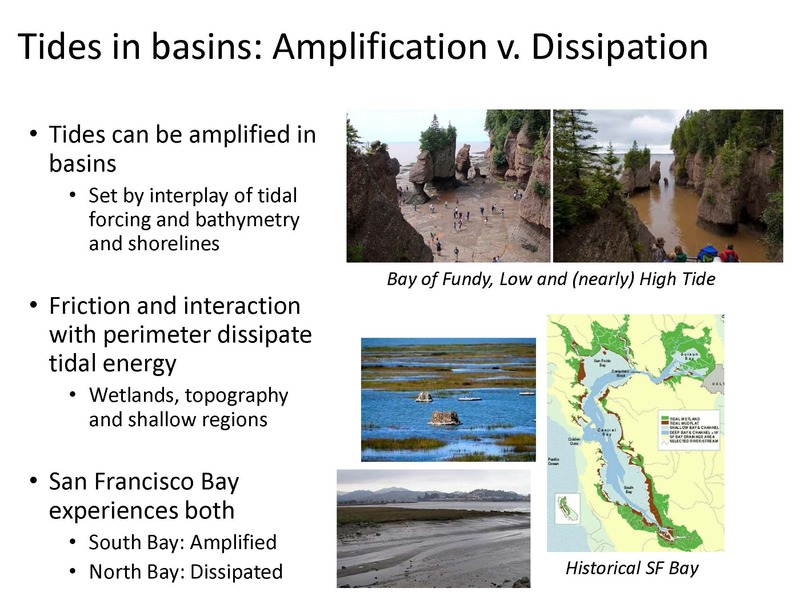 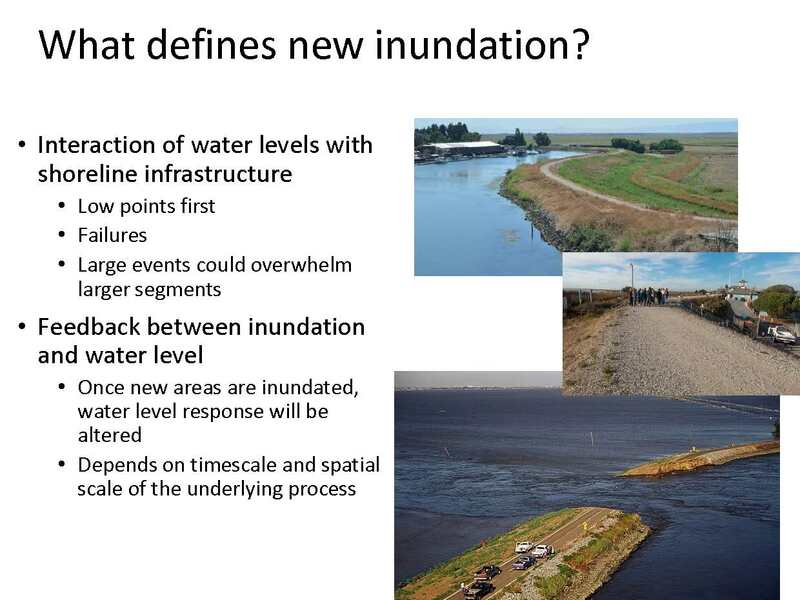 He noted that these apply for any coastal embayment, but his talk would focus on the processes that are most important for San Francisco Bay. 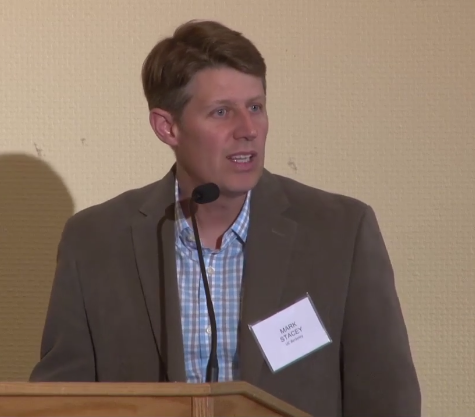 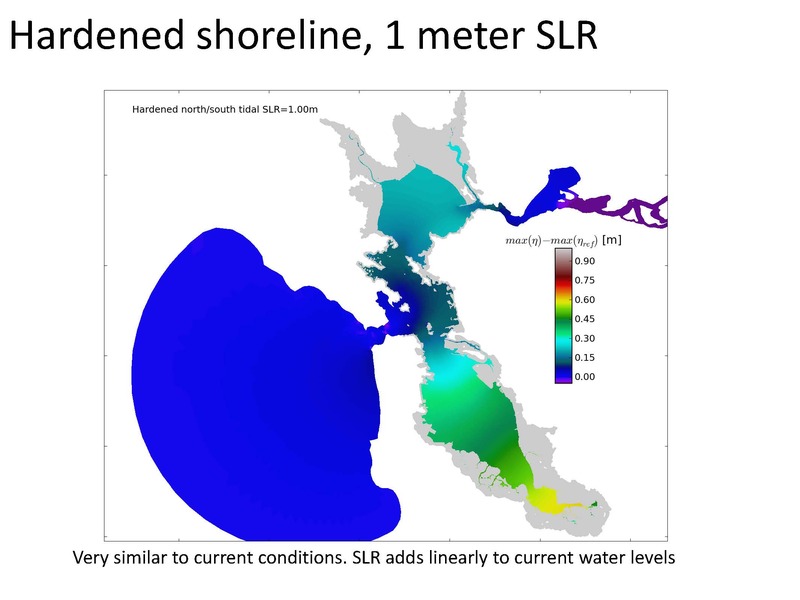 Freshwater flows: “Terrestrially sourced water is a huge part of the story, and backwater curves and backwater flooding is an important part of the process, so when we start looking out a century, how are precipitation patterns going to change and what does that mean for local urban runoff into the streams that then define local flooding events,” he said. 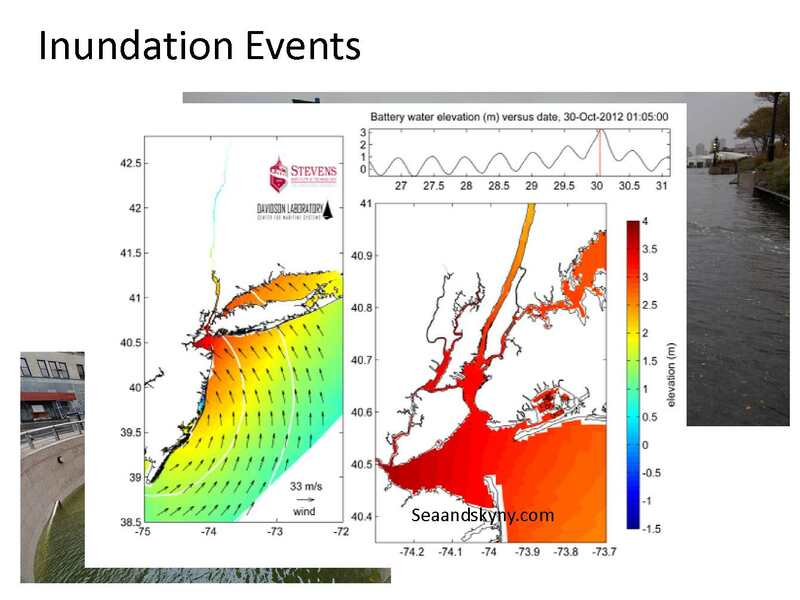 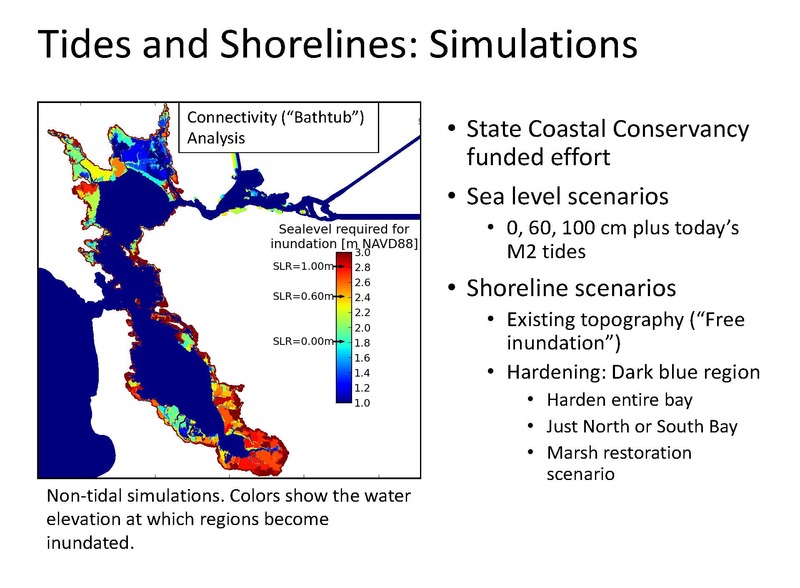 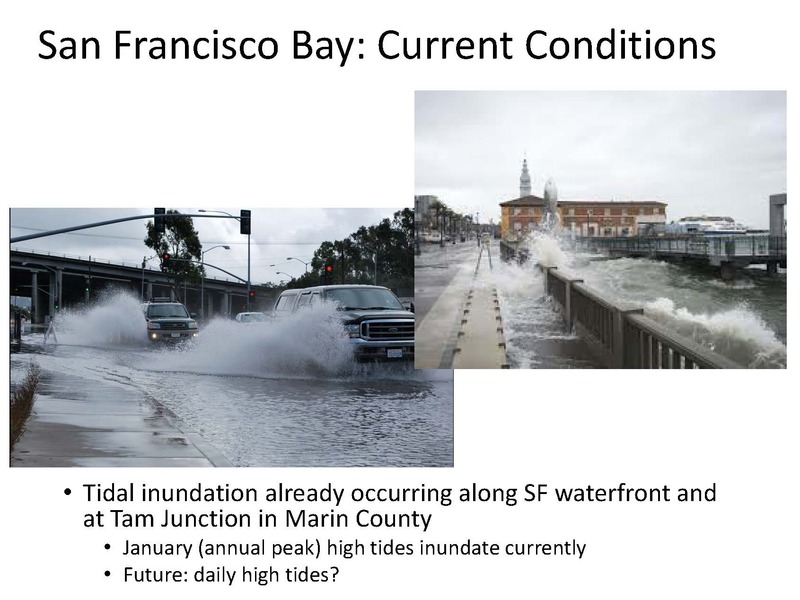 Those are the processes that drive water level in the bay; when we start to consider the interaction of water level with shorelines, we want to understand what new set of interactions define new inundation, he said. 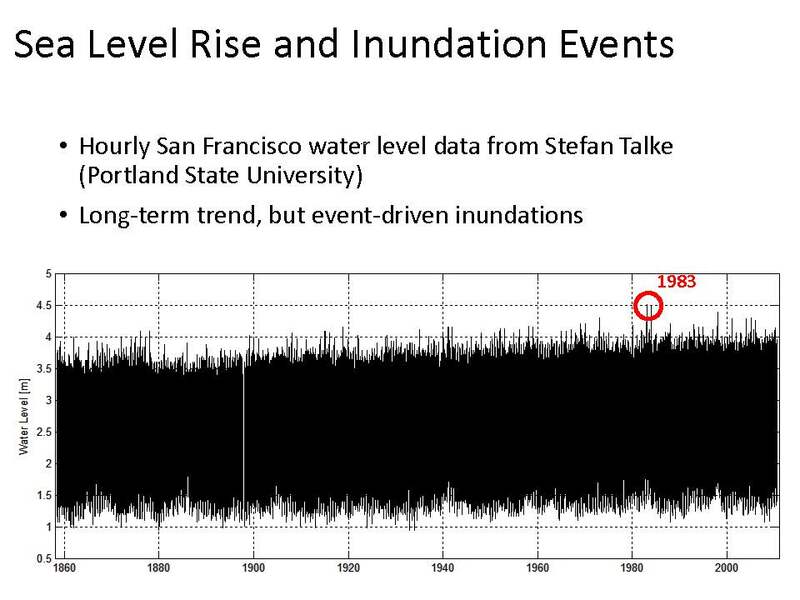 “Large events can be a confluence of a number of different processes: high water in the Pacific, combined with high tides, combined with winds of the right orientation, and freshwater flow events of large magnitude could overwhelm large segments of that infrastructure, leading to extensive inundation,” he said. 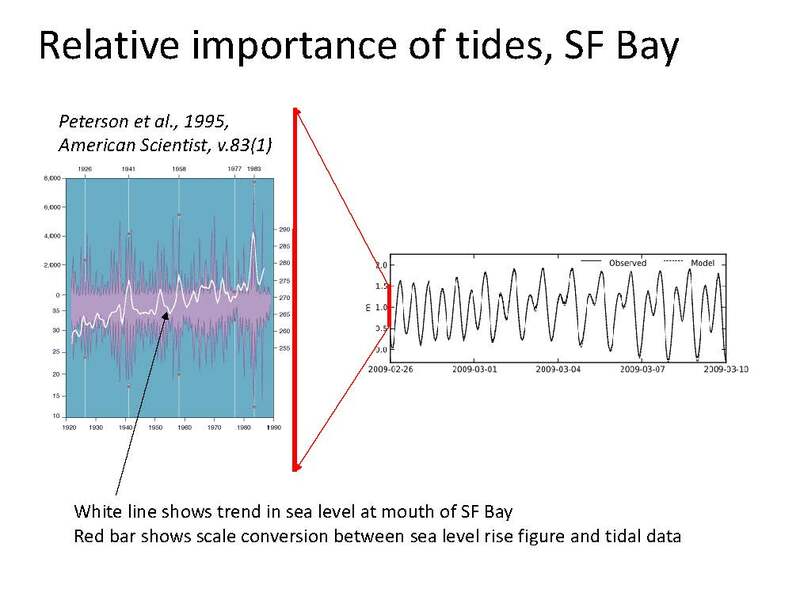 Next, he presented a slide showing sea level at the mouth of San Francisco Bay, noting that the white line on the graph on the left is sea level rise, about 10 centimeters over the last century and on the right is a tidal time series from the mouth of San Francisco Bay. 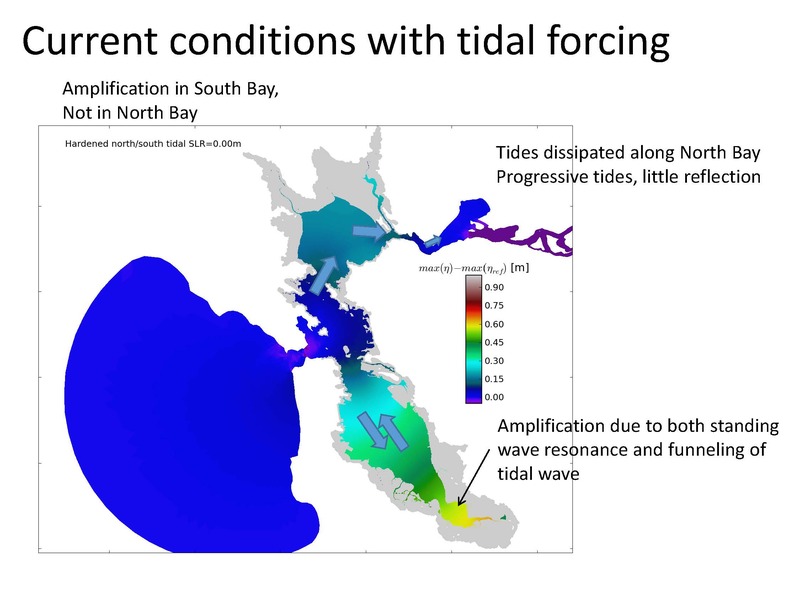 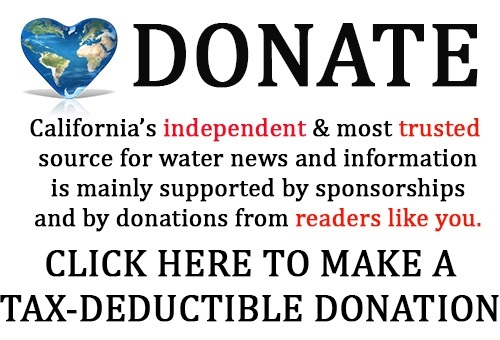 “The tidal range in San Francisco Bay is about an order of magnitude larger than the long-term trend in sea level rise, so small changes in the tidal response of the bay could be comparable to long term sea level rise when we think about changes in water level,” he said. 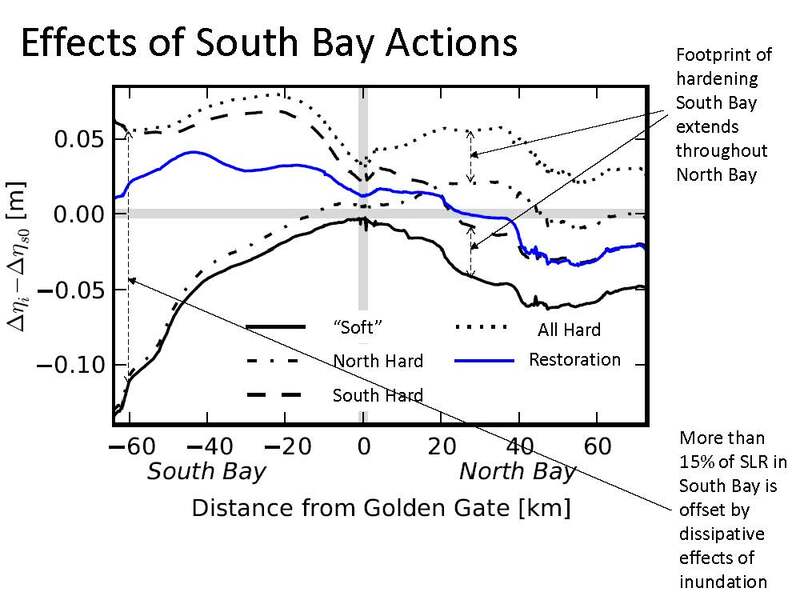 For the study, at first they focused on two scenarios, which were end points for the analysis. 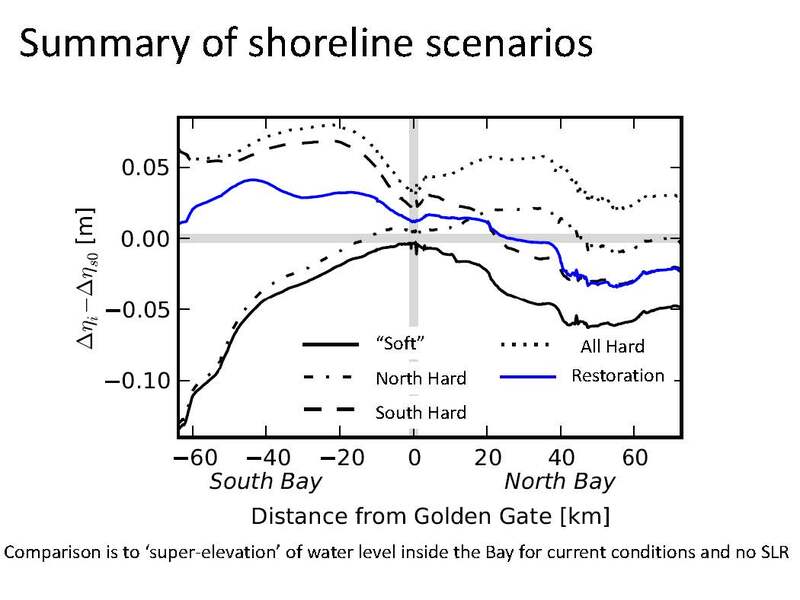 The first scenario, the ‘hardened’ scenario, considered what would happen if sea walls were built as high as needed to key the bay waters where they are today, and the other scenario was if they did nothing and allowed the water to overtop levees and inundate the lands. 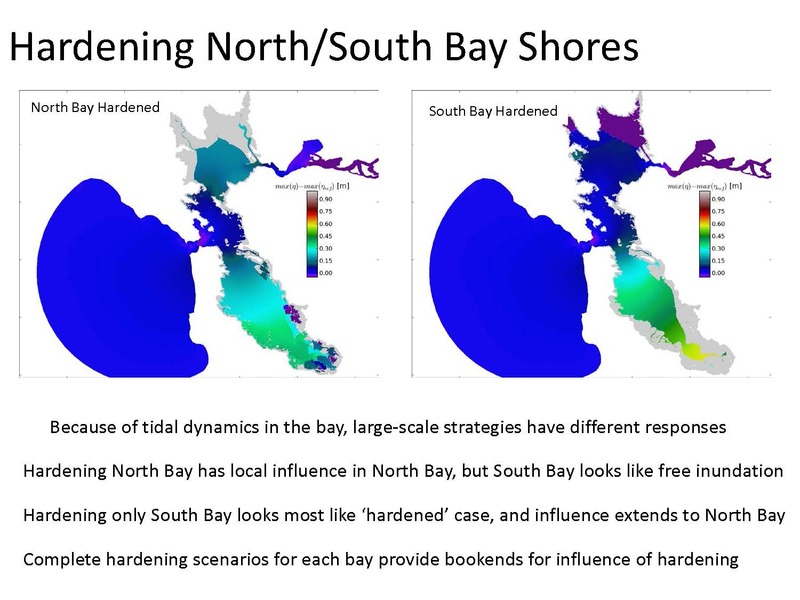 They then created two hybrid scenarios, one where the south bay was hardened and nothing was done in the north bay, and the other was if they hardened the north bay but did nothing in the south bay. 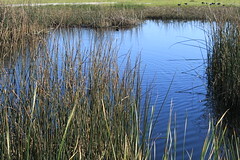 Late in the project, on additional scenario, a restoration scenario, was added which considered what would happen if all planned restoration projects on the table were to proceed. “Again, 5 centimeters may not be very much, but when we start thinking about the frequency of inundation due to high water events, this 5 centimeters is going to cross different thresholds at different locations at different times, and so you’re going to increase the frequency of coastal flooding, even with a small change in the water level,” he said. 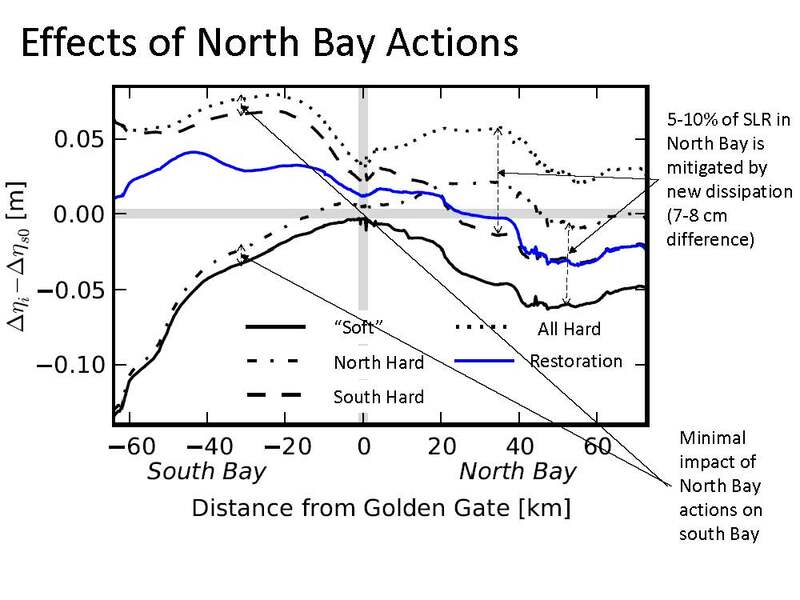 For more details on this research, see: Holleman, RC and MT Stacey. 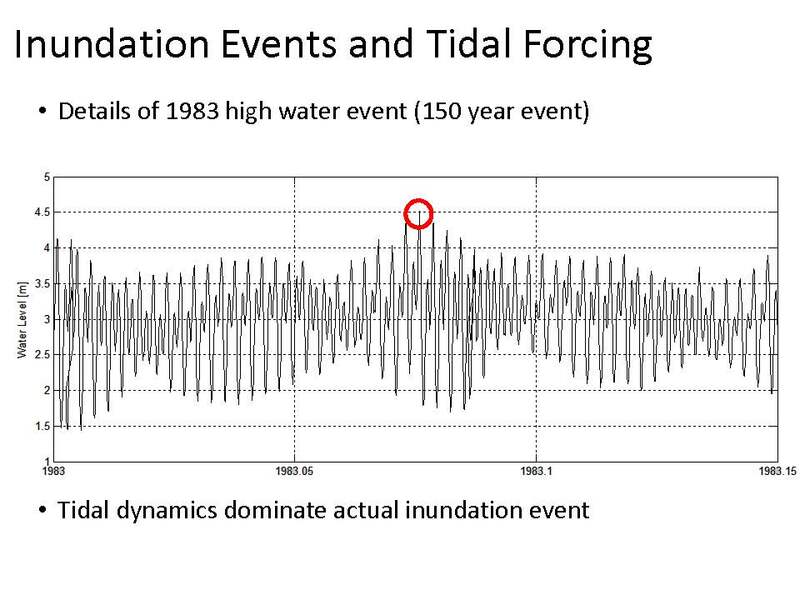 “Coupling of Sea Level Rise, Tidal Amplification, and Inundation.” Journal of Physical Oceanography 44.5 (2014): 1439-1455. 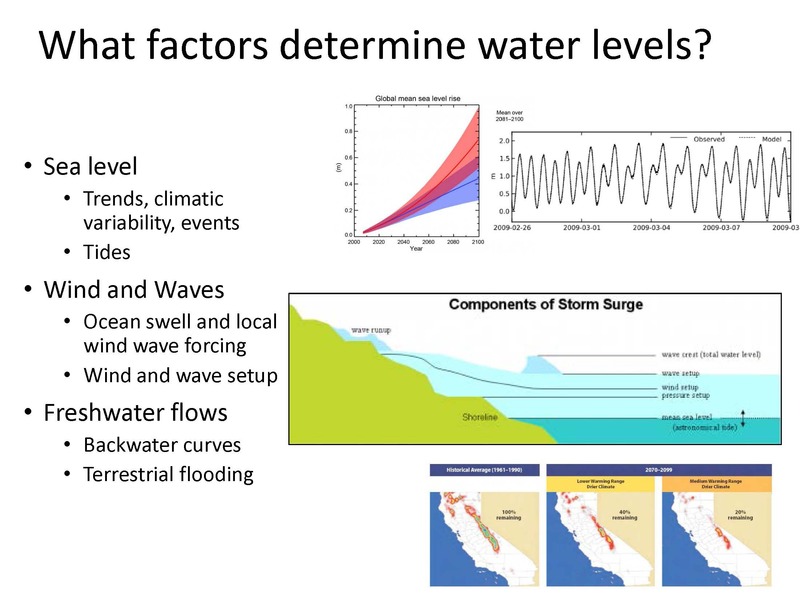 Click here to watch video of this presentation. 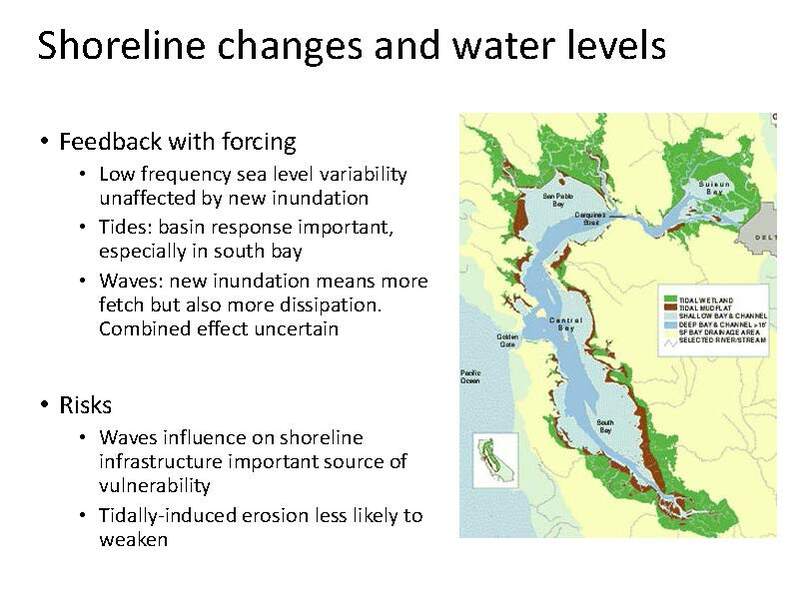 Part 1: Climate change and the Delta: What do we know about climate driven variability of the Bay-Delta ecosystem?